The Surgical C-Arm Table 840 is designed for image-guided fluoroscopic procedures where stability, access, and precise, quiet, vibration-free positioning are essential. 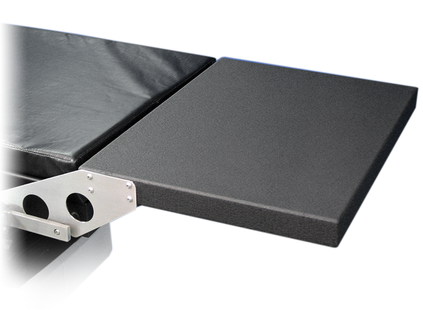 A cantilevered low attenuation carbon fiber tabletop, with choice of rectangular or contoured design, accommodates portable or ceiling-suspended C-Arms. The rectangular top offers additional space to allow for superior image quality for long-leg runoff studies. 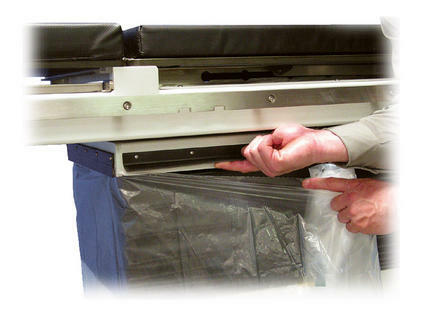 The contoured top provides ample workspace for anesthesiologists, yet the narrowness required for cervical procedures. Choose the top that best suits your needs to achieve optimum image resolution. The extra-large, 75" radiolucent area, free-float X-Y tabletop, motorized control of height, isocentric lateral roll, Trendelenburg motions and the catheter tray extension make the Surgical C-Arm Table - 840 ideal for cardiovascular and interventional radiology applications. The radiolucent area is free of cross members, allowing full fluoroscopic visualization and unobstructed C-Arm positioning. Functional design provides complete access with reduced radiation exposure to clinicians. Patient comfort and stability are assured by two-inch thick table padding and three adjustable straps with hook and loop fastening. The contoured tabletop features a face cutout for prone positioning. The portable hand-held and foot-operated controllers ensure quick and safe tabletop positioning, and can be positioned from any point around the table. Both controllers offer the freedom to adjust height, lateral roll and Trendelenburg motions. The hand-held controller provides the back-to-level function. The foot-operated controller also releases the tabletop for X-Y positioning and is ideal when hands are busy with other functions. The ergonomic mushroom-shaped control optimizes command of the SmoothGlide™ free-float tabletop. When employing any degree of tilt or roll, X and Y positions are “locked” to prevent gravity-induced movement. 35" head-totoe (X) can be maintained during lateral roll; and side-to-side (Y) can be maintained during Trendelenburg positioning. Isocentric lateral roll is a unique movement that maintains center of the focal area, minimizing image distortion. Reducing the time required for adjustments, table or patient, ultimately reduces exposure to scatter radiation. Both AC and battery power are standard. When operating on battery, there are no power cords to hinder movement or block casters. An optional battery with separate charging unit can provide continuous,s cordless operation. Stable, Accessible, Precise, Quiet, and Vibration-Free Positioning! The portable hand-held and foot-operated controllers offer the freedom to adjust height, lateral roll, and Trendelenburg motions. The foot-operated controller also releases the tabletop for X-Y positioning and can be used when hands are busy with other functions. The hand-held controller hangs on an accessory rail when not in use. The ergonomic mushroom-shaped control optimizes command of the SmoothGlide™ free-float tabletop. When employing any degree of tilt or roll, X and Y positions are “locked” to prevent gravity-induced movement. Selective “lockout” of X or Y movement is also provided: 35" head-to-toe (X) can be maintained during lateral roll; and side-to-side (Y) can be maintained during Trendelenburg positioning. Power: 115 VAC or 230 VAC and battery. Battery automatically charges when table is plugged in. An optional battery with separate charging unit provides continuous, cordless operation. No. : 601.1.M90, EN 60601-1, IEC 60601-2-46 and CE marked. 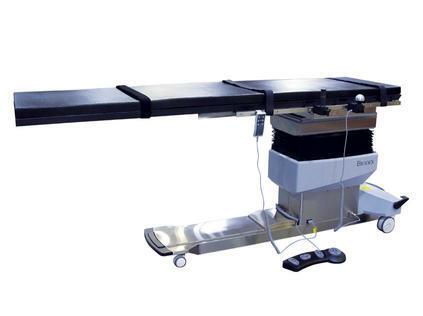 Biodex Surgical C-Arm Table 840 is designed for image-guided fluoroscopic procedures. Ideal for cardiovascular procedures with three-axis motorized positioning and XY free-float top.